First as an attorney and later as a judge and mediator, the Hon. Thomas R. Mitchell was known for getting things done fast and efficiently. His ingenuity and graciousness were helpful qualities throughout his career where he was respected for bringing warring parties together to help them stop warring. 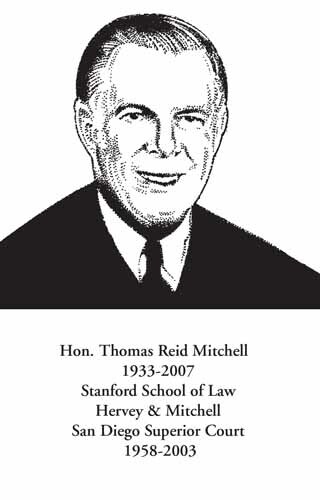 A California native, Judge Mitchell was born in Los Angeles and attended Stanford University where he received his B.A. in 1955 and Stanford Law School where he earned his law degree in 1958. In 1959, he moved south to San Diego and joined the firm Hervey and Mitchell. He continued with that firm and its successors until he was appointed to the San Diego Superior Court by Gov. Pete Wilson in 1992. Judge Mitchell brought more than 30 years of probate experience with him when he went on the bench. Eight of his eleven years as a judge were spent in Probate Court where he designed a mediation program tailored to address unusual issues, which arise in probate and trust proceedings. After leaving the bench in 2003, Judge Mitchell joined Jams as a senior partner and was a frequent panelist and lecturer for California State Bar’s Continuing Education Division, the Judicial Council Continuing Studies Program, and The Rutter Group. His service to the public extended beyond his tenure as a judicial officer. He served on the Board of Trustees of The Children’s School in La Jolla in addition to the Judicial Council’s Probate and Mental Health Advisory Committee.